by PaulEMoz in "SNES", "SWIV", "Silkworm", "Super Nintendo", "helicopter", "jeep", "shmup"
Silkworm is a game I loved on the Amiga. 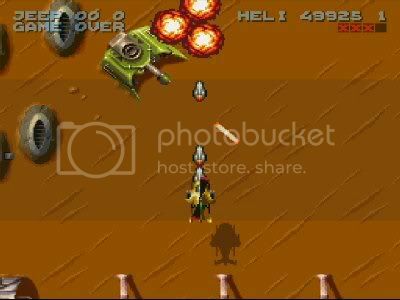 It's a horizontally-scrolling shoot 'em up, where you can choose to play as either a helicopter or a jeep, blasting opposing military forces to Kingdom Come. It's really hard to play as the jeep in a single player game, but the real beauty of this is the co-operative two player mode. The helicopter relieves a lot of the pressure on the jeep, making the jeep much more effective. It started out as an arcade game and was converted to the home formats, where it was so successful that a pseudo-sequel, SWIV, was released. And, as interested as I was, I never got to play that. And that obviously did OK, because another sequel was produced for the SNES, entitled Super SWIV, and that's what I've just played. Helicopters, as a rule, should stay away from giant lasers. They're harmful. Given my enjoyment of the original game, and that I was quite looking forward to playing this, I came away a touch disappointed. For one thing, switching the game to a vertically-scrolling shooter has taken away a fair bit of the charm and polish. It actually looks like an older game than the original, which is a bit odd. As before, the jeep is more difficult to play with than the helicopter. But not in a good, challenging way - more in a weird, difficult-to-control way. That said, given enough practice, I would say it could be perfectly workable... if you hold the button down, the firing locks in the direction you were travelling at the time. I just don't happen to like it. And so I've been playing Super SWIV as a simple, straightforward shmup, using the helicopter, relegating it to the ordinary. There's nothing wrong with that, particularly... it's a serviceable enough shooty game. But it certainly didn't grab me like the original Amiga version of Silkworm did.